Hotels, Flights, Cruise Vacations and other online travel booking items have always been popular internet searches, either for personal or business purposes. I re-designed a website I originally built over 10 years ago to sell travel services through my affiliate relationships with Travelocity, Hotels.com, Trivago, Priceline, and other vendors. My new website is mobile-responsive and a great example of how anyone can monetize a personal blog or website, or add an income stream to an existing commercial site by placing text ads or banner ads to items that are related to the main theme of your site. Visit www.TravelUSAandWorld.com/ to see how I optimized it with my own keywords so that I had a chance of ranking in Google search results. Make hotel or flight reservations while you’re there, and you’ll be helping to support several gratis websites I’ve built for local Wilmington, Delaware area non-profits! Contact me anytime if you’d like to brainstorm how to incorporate affiliate advertising or other income streams into your own business model. Of course, it’s more appropriate to add these types of links to personal sites, hobby sites, or home business sites where you’re not as concerned with distracting your visitors from the main goal of buying your products or services. For example, the first website I ever built was my www.WorldofBeerBottles.com. That’s where I first gained experience with adding affiliate advertising banners for beer posters, “Beer of the Month Clubs” and beer themed books & posters. Pitching related products or services is a benefit to your visitors and could even motivate them to buy from you if the see that you’re affiliated with a well-known brand! In many cases, it’s best to book travel through an agency. I’d be happy to refer you to one of my Delaware area friends, so just email or call me at 302-633-1482. 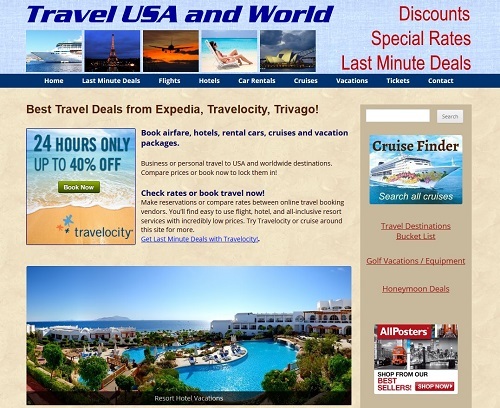 If you just need hotel reservations, last minute flight deals or a rental car, you’ll get the same great deals by clicking the links at Travel USA & World, which I specifically built as a shopping mall of major travel providers such as Travelocity, Priceline, Flight Network, Cruise Direct, Ticket Liquidator, and other travel links. To improve SEO and to make it visitor-friendly, I include valuable information such as travel tips and other useful information for travelers. Wilmington Delaware travel! 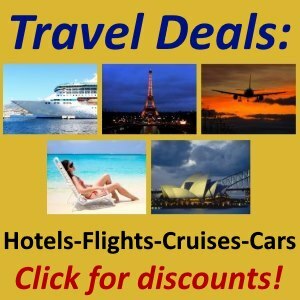 There are articles submitted to me by other websites who were happy to provide me with business & pleasure travel ideas in exchange for links to their own websites. I feature the very first video I created over 12 years ago, along with tips for travel safety, trip planning and packing, how to get the best airline seats, airport parking secrets, vacation destination suggestions, and more! Remember, you can’t just borrow some text and images and put up a junky site. Treat it as a business and put effort into quality content and search engine optimization including title tags, meta description, image alt tags, submitting to search engines and all of the other little jobs I include when building a website for a customer in Wilmington, Delaware or anywhere else in the USA. Adding travel posters helps me cross-market! This entry was posted in Internet Marketing, Web Design and tagged affiliate ads, affiliatelinks, book travel, online advertising, online travel booking, travel deals on June 14, 2017 by recast.